When it comes to cooking pastured or grass-fed meats, remember that these meats are leaner than the usual grocery store grain-fed meats, so you need to cook them a little differently. For grilling steaks, keep the degree of doneness to medium at the most, although I recommend medium-rare. Use a lower heat and check it sooner than you think you should until you get used to cooking pastured meats. With dry aged meat, not only is it lean, it also has a lower moisture content, so low heat is a must that the meat does not dry out. If you are grilling, use a lower direct flame to mark the steaks and get a bit of char on the outside, then move the meat off the fire to the side of the grill and finish with indirect heat. If cooking on the stove-top, sear the meat in the pan, and then once you have turned the meat and seared both sides, move the meat to the oven to finish at a temperature around 325°F. For braises, cook the meat gently. Sear the meat for flavor, then add the liquid. Bring to a boil, skimming off impurities that form on the surface. Lower the heat to a bare simmer, or better yet, place in the oven and finish cooking there at a low heat, about 300°F. For roasting these meats, use a gentler heat, and marinating can be a good idea. While learning how to cook pastured meat, keep the seasoning fairly simple until you are more familiar with the characteristics of this meat as it cooks, and to also to get a better grasp of the meat flavor. Grass fed meat has little more chew to it, and the flavor, which can be hard to describe, really is “beefier”. The lamb I have had has a fine lamb flavor without the tallow-like funk you find in older, fattier lamb. Goat tends to have a higher bone to meat ratio it seems, so be prepared. That said, the flavor is wonderful – sort of like lamb, without the gamey quality you can get as a result of the fat, and with a deeper flavor. Be sure not to overcook the goat or it will be quite tough. Remember – you can always throw it back on the heat, but once it is overcooked, nothing will help! Keep in mind that only certain goats give this mellow flavored meat, so be careful where you shop if you are not getting your goat at the farmers markets. Old Creek Ranch carries excellent goat rib chops. • Grass-fed beef is lower in fat and calories, overall. Switching to grass-fed beef can help lose weight. • A six-ounce serving of pastured beef has 100 less calories than grain fed beef. • Contains significantly higher levels of vitamin E, beta-carotene, omega 3 fatty acids. Omega-3s are the “good fats” that are essential to good health that the body can not manufacture. Omega-3s are necessary for good cardio health, heart rhythm, and blood pressure, fight depression, Alzheimer’s disease, and cancer. They also aid in recovery from surgery. • CLAs (conjugated linoleic acids), a family of nutrients that have been shown to be anti-carcinogenic and anti-oxidant. CLAs also are supposed to decrease risk for heart attack and decrease inflammation as well, and there are studies that suggest CLAs have other salubrious effects on health, too. • On the whole, grass fed ruminants (such as beef and sheep) have 300 to 500% more CLAs than grain fed animals. By the way, synthetic CLA supplements don’t have the same efficacy that those consumed naturally do. • Did you know cattle use 70% of the antibiotics used in the USA? Antibiotics are necessary for cattle in feedlots to protect them from diseases they get resulting from eating grains, poor manure management, and from being stressed out from living in feedlots. Antibiotics are rarely, if ever, used with grass-fed animals. • The benefits of pastured animals in the diet also apply to eggs and milk products. Cheeses and eggs from these animals contain many of the benefits mentioned above, and are lower in cholesterol and saturated fats. Health Benefits: The red pigments in cherries contain natural anthocyanins. Anthocyanins are anti-inflammatory pain relievers In fact, 20 cherries are 10 times stronger than aspirin or ibuprofen and have positive effects on gout and arthritis pain. They help shut down the enzymes that cause tissue inflammation in the first place. Anthocyanins found in cherries also block inflammatory enzymes, reducing pain. There is also evidence that cherries are so powerful they may reduce the risk of cancer by fifty percent. Cherries may provide antioxidant protection comparable to commercially available supplements, such as vitamin E and vitamin C. In addition to being rich in potassium, vitamin C, and B complex, research has shown that cherry consumption can help the body prevent heart disease and cancer, as well as provide pain relief and improved bone health. These health benefits are possible due to the antioxidants found in cherries, the most vital of which are the flavonoids anthocyanins and quercetin, and the phenolic acid amygdalin. According to researchers, a flavonoid found in cherries that has anticarcinogenic properties called quercetin can help to prevent heart disease. Cherries are considered a nutritionally significant source of quercetin, containing large quantities per serving that surpass most fruits. A phenolic acid called amygdalin, also termed Vitamin B17 and laetrile, found in the kernels of cherries and other fruits, has been shown to reduce tumor size and further spread of cancer, as well as to alleviate the pains of the cancerous process. Populations such as the Hunza in Pakistan that have always incorporated amygdalin into their diets have remained cancer free, leading scientists to believe that its consumption could also be a powerful cancer prevention food. Sweet cherries are also considered to be excellent sources of boron. Boron consumption, coupled with calcium and magnesium has been linked to increased bone health. Boron is also known to boost estrogen levels in postmenopausal women, stimulate the brain, and aid in prevention of osteoporosis. Tart cherries naturally pack a health-promoting punch that provides pain relief for many consumers. Ongoing research shows that tart cherries are a rich source of antioxidants, including melatonin, which may help to relieve the pain of arthritis, gout, and possibly fibromyalgia. To date, no other fruit or vegetable has been found to have the pain relieving properties of tart cherries. In addition, the antioxidants in tart cherries can help fight cancer and heart disease. Apples are an excellent source of dietary fiber, providing you with nearly 20% of your needs for the day. Because of about 25% of the fiber found in apples is soluble. The type of fiber may help reduce cholesterol by preventing it from being absorbed by the body and the carbohydrates are excellent source of long-term energy. Peaches are an excellent source of Vitamin C and dietary fiber, providing you with nearly 20% of your needs for the day. The type of peach fiber may help reduce cholesterol by preventing it from being absorbed by the body. The dried peaches are very good in taste and delicious, full of potassium. Red-pigmented beta-carotene is a powerful member of the antioxidant family. Visible in the vibrant orange color of peaches, beta-carotene is transformed to vitamin A in the body. Vitamin A plays a crucial role in maintaining the skin, internally and externally, as well as in protecting the eyes, building strong teeth and bones and healthy hair. Additionally, research indicates that vitamin A has been linked to reduced rates of cancer and heart disease. Just one serving of Washington peaches contains six percent of the U.S. RDA for vitamins. Research indicates that vitamin E is particularly effective in preventing heart disease and breast cancer. While vitamin E is primarily found in vegetable oils, nuts, seeds and wheat germ, peaches contain a significant amount. In a study conducted by Ohio State University, one half-cup serving of canned peaches contributes up to 24% of the U.S. RDA for vitamin E.
Peaches offer a source of carbohydrates, protein, dietary fiber, vitamin C and vitamin A. This nutritious fruit also contains boron, known to boost estrogen levels in postmenopausal women, stimulate the brain, and aid in prevention of osteoporosis. Boron consumption, coupled with calcium and magnesium has been linked to increased bone health. Washington dried tomatoes have a sweet, intense tomato flavor, brilliant red color and chewy texture making them a good choice for use in cooking, sauce and salad preparations. Drying removes only the water from the tomato, which concentrates the tomato flavor and nutrients. Rich in vitamin A, B, C and a valuable source of iron, lycopene, potassium and phosphorus. Pears offer an excellent source of vitamin A and C, and dietary fiber. Pears also contain phosphorus and pectin, a soluble fiber that helps you to control cholesterol levels and cellulose, an insoluble fiber that promotes normal bowel function. Dried pears offer a good source of vitamin C, folate, and dietary fiber. Providing some iron and potassium. The fresh version (plums) and the dried version (prunes) of the plant scientifically known as Prunus domestica have been the subject of repeated health research for their high content of unique phytonutrients called neochlorogenic and chlorogenic acid. These substances found in plums and prunes are classified as phenols, and their function as antioxidants has been well documented. Phytonutrients and antioxidants fight free radicals. Apricots can help protect the heart and eyes, as well as provide the disease-fighting effects of fiber. The high beta-carotene and lycopene activity of apricots makes them important heart health foods. Both beta-carotene and lycopene protect LDL cholesterol from oxidation, which may help prevent heart disease. 1. Your biggest culprit for tough grass fed beef is overcooking. This beef is made for rare to medium rare cooking. If you like well done beef, then cook your grass fed beef at very low temperatures in a sauce to add moisture. 2. Since grass fed beef is extremely low in fat, coat with virgin olive oil, truffle oil or a favorite light oil for flavor enhancement and easy browning. The oil will, also, prevent drying and sticking. 3. We recommend marinating your beef before cooking especially lean cuts like NY Strip and Sirloin Steak. Choose a recipe that doesn’t mask the delicate flavor of grass fed beef but enhances the moisture content. A favorite marinade using lemon, vinegar, wine, beer or bourbon is a great choice. Some people use their favorite Italian salad dressing. If you choose to use bourbon, beer or vinegar, use slightly less than you would use for grain fed beef. Grass fed beef cooks quicker so the liquor or vinegar won’t have as much time to cook off. For safe handling, always marinate in the refrigerator. 4. If you do not have time to marinate, just coat your thawed steak with your favorite rub, place on a solid surface, cover with plastic and pound your steak a few times to break down the connective tissue. As an added benefit your favorite rub will be pushed into your grass fed beef. Don’t go overboard and flatten your beef unless your recipe calls for it. If you don’t have a meat mallet, use a rolling pin or whatever you feel is safe and convenient. 5. Stove top cooking is great for any type of steak . . . including grass fed steak. You have more control over the temperature than on the grill. You can use butter in the final minutes when the heat is low to carry the taste of fresh garlic through the meat just like steak chefs. 6. Grass fed beef has high protein and low fat levels, the beef will usually require 30% less cooking time and will continue to cook when removed from heat. For this reason, remove the beef from your heat source 10 degrees before it reaches the desired temperature. 7. Use a thermometer to test for doneness and watch the thermometer carefully. Since grass fed beef cooks so quickly, your beef can go from perfectly cooked to overcooked in less than a minute. 8. Let the beef sit covered and in a warm place for 8 to 10 minutes after removing from heat to let the juices redistribute. 9. Never use a fork to turn your beef . . . precious juices will be lost. Always use tongs. 10. Reduce the temperature of your grain fed beef recipes by 50 degrees i.e. 275 degrees for roasting or at the lowest heat setting in a crock pot. The cooking time will still be the same or slightly shorter even at the lower temperature. Again . . . watch your meat thermometer and don’t overcook your meat. Use moisture from sauces to add to the tenderness when cooking your roast. 11. Never use a microwave to thaw your grass fed beef. Either thaw your beef in the refrigerator or for quick thawing place your vacuum sealed package in water for a few minutes. 12. Bring your grass fed meat to room temperature before cooking . . . do not cook it cold straight from a refrigerator. 13. Always pre-heat your oven, pan or grill before cooking grass fed beef. 14. When grilling, sear the meat quickly over a high heat on each side to seal in its natural juices and then reduce the heat to a medium or low to finish the cooking process. Also, baste to add moisture throughout the grilling process. Don’t forget grass fed beef requires 30% less cooking time so watch your thermometer and don’t leave your steaks unattended. 15. When roasting, sear the beef first to lock in the juices and then place in a pre-heated oven. Save your leftovers . . . roasted grass fed beef slices make great healthy luncheon meats with no additives or preservatives. 16. When preparing hamburgers on the grill, use caramelized onions, olives or roasted peppers to add low fat moisture to the meat while cooking. We add zero fat to our burgers (they are 85% to 90% lean) . . . so some moisture is needed to compensate for the lack of fat. Make sure you do not overcook your burgers . . . 30% less cooking time is required. · Don’t microwave. This process can change the texture and flavor of beef, and reduce tenderness. · Don’t cook frozen or partially frozen beef – it causes the meat to be dry and tough. · Don’t defrost roasts or steaks in a microwave oven – it causes tough spots. Thaw in your refrigerator for 12-24hrs. · Don’t cook steaks to medium well or well done. If you usually like your meat well done, try a steak done to medium. Grass fed steaks have a different texture and taste at medium. If you are a die-hard well done fan, add a little marinade, and cook as slowly as possible. I conveyed some questions about organic practices and the merits of alternative sweeteners by co-op members to the Vincent Cranberry farmer, and this is his reply:Great questions and we get them all the time! Here’s a link to a page on our website that should cover most of the ones about our farming practices: http://www.vincentcranberries.com/sustainable-farming/. Also, we just became Food Alliancecertified which in many ways is superior to and more pragmatic than certified organic!Also, Cranberries are not part of the notorious ‘Dirty Dozen’. 1- It’s naturally sweeter than sugar and corn syrup so we don’t have to use near as much! Take note of the fact that our juice has only 16 grams of sugar instead of the 26 to 38 of all other blended juices. 2- The Agave nectar in its unprocessed form like we use is very much like molasses. For that reason it neutralizes the tartness a little more than sugar, which supports us using even less of it. We use 1.25 oz. of Raw Agave for the entire bottle! When I was experimenting with Sugar and other sweeteners I had to use so much of it that I had to significantly lower the amount of Cranberry (currently we have more than double the amount of Cranberry than ANY other blended juice). Without a lot of Cranberry, it might as well be called something else! Re: Unsweetened Dried Cranberries. I’ll look into what it will take process wise to make some! Re: the benefits of Apple Juice. The apple juice is indeed Organic but the Cranberries are not which is explained by following the link above. I’m not an expert regarding the use of Apple vs. Sugar. However my gut instinct has always been that eating something that came from mother nature and isn’t processed or adulterated is better than something that isn’t! Greetings all! My wife Dani, my 6 yr old Cale and I are in our little mini van driving back from what has to be the 2nd most beautiful place on earth besides my hometown of Bandon, Oregon(insert bias footnote here).Many apologies for all the mix ups in getting the juice ‘hot potatoed’ (spellcheck from Dan Quayle needed) up to your co-op.We enjoyed our short but beautiful drive. It was Cale’s first ferry ride when we took the long way back south from Mt. Vernon through Oak Harbor and on to the Ferry that zipped us over to Mukilteo. Please feel free to contact me with any questions or suggestions, etc. It’s an honor that you have taken our family into your homes and onto your dinner table. You will notice a change in our milk offerings, and I hope there’s something for everyone. Both of these farms have been family run for five continuous generations. The reason for the switch is to honor the growing sentiment for local and regional and lightly processed foods. Also, it has been noticed that Market Place now sells Organic Valley milk cheaper than we can offer it and most people shop for price. I hope you are pleased with the new milk in our fridge! Last week Anna and Steffi and I made a long day trip to Skagit to find regional products for our store, following the leads provided by the Puget Sound Food Network. First we bought pickles and sauerkraut from Pleasant Valley Farms in LaConner. This is a huge pickling operation with acres of big vats and a pickle odor in the air. The good thing is that the cucumbers and cabbages are right out there in the field. Other major pickle factories (Steinfield, Farman, and Nalley, plus the little guys they’ve gobbled up) source their cucumbers from India, for heaven’s sake!) There are two articles about the Skagit pickle phenomenon on the windowsill in the co-op. Then we went looking for meat–specifically sausages and bacon. We stopped at Del Fox and found only industrial meat, so we went farther south and bought some “natural” product from Silvana Meats, near Arlington: sausages, ham hocks, and bacon. It’s very yummy and it flew out of the store. I have reservations about “natural” practices, because in spite of eschewing hormones and fertilizers and the like, they nevertheless finish the animals for 60 to 90 days in confinement–feed lots or CAFO facilities in eastern Washington or Oregon–thereby converting the “good” fat Omega 3 profile to the bad fat profile. I ate it and liked it, but I won’t want it again. Most people would find all natural meats satisfactory, however. Should we get more? We stopped by Hidden Meadow Ranch outside of Mt. Vernon and inquired about obtaining pork and poultry in the future. We liked Laura’s operation and her care of the animals which she raises very responsibly. Next we stopped to get some sparkling juices in Mt. Vernon, “Skagit Fresh” made from apples and berries from three nearby farms. After that we fetched honey for a good price from Bruce Bower, who lives east of Mt. Vernon and has 670 hives scattered about the county. He’s on his way now to pack his bees off to California to pollinate the almond orchards. I worry that the bees might be badly stressed from travel and stressed worse by encountering bees from China, Turkey, Peru, etc., where they could be exposed to pathogens. But it’s very good honey, “mystery honey”, Bruce told me, because the bees forage on such things as blackberry, thistle, snowberry, knotweed, honeydew from fir trees. Polyface style, homeopathic, nutrition-centered farmers with outstanding product. Although they had piles of fantastic eggs, we were told there was no way they could ever sell us any; I think they’re all headed for the various farmers markets in the region. But we got a small amount of their pork products which are outstanding and think we should either join the Anacortes buying club or form one of our own if we can figure out the transportation. George and Eiko do a wonderful job on their meat. Finally we quickly stopped at Golden Glen Creamery to pick up ten dozen eggs. We don’t approve of the Wilcox eggs from UNFI, which, though produced in Roy, Washington, and called “organic”, come from a flock of 800,000 hens in big factory warehouses. These Golden Glen hens are a small flock that live in a chicken tractor and play all day outdoors pecking in the grass; they lay pretty eggs–old fashioned farm eggs. More are coming this Thursday and Golden Glen will deliver them to the ferry terminal and our wonderful Anna’s willing to take the round trip on the ferry to bring them to the co-op. It was a fun trip. I tell you all these things because I need feedback on these matters! What do you want us to bring to our store? I have made steps for the co-op to join as a founding member, which will entitle us to have access to products from throughout the Puget Sound region. The more regionally and locally we source our food, the fresher it will be with potentially greater nutritional value, and we’ll reduce our dietary carbon footprint. With this new sourcing it becomes increasingly important for those of us who do the ordering to hear your views on local and organic so we can make product selections accordingly to satisfy the needs of all members. And if you know of local and regional items you think the co-op ought to stock, please tell us about them. Stand by for further developments! 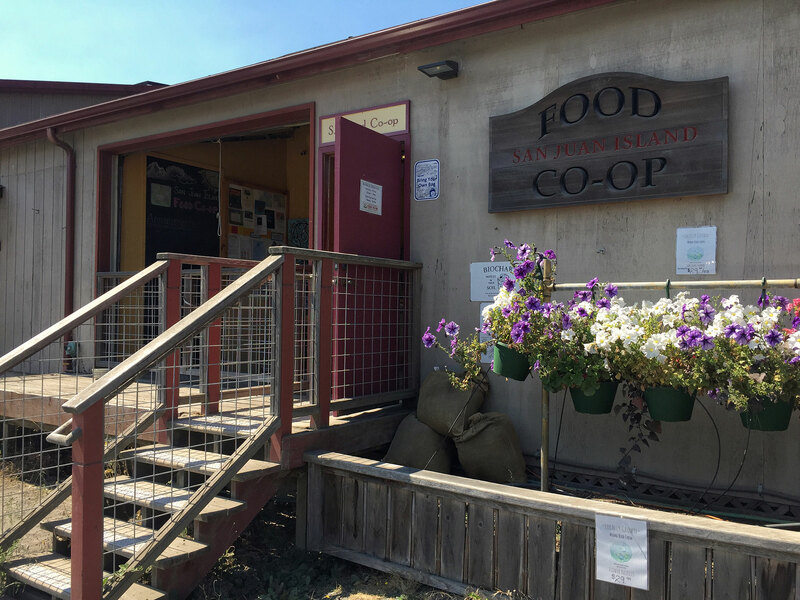 Our “account manager,” Lucy Norris, has quickly connected us to producers in Skagit Valley, and Anna, Steffi, and I are taking a field trip Tuesday to collect items for the Co-op. Some are certified organic; others don’t make that claim but they are surely local/regional. We plan to ask all the right questions and put our eyeballs on whatever we can to be sure we bring good food to our store. We want to hear members’ views about the values that matter most. In November we brought Pleasant Valley pickles and sauerkraut (see http://www.seattlepi.com/business/357313_pickles02.html and http://rsfsocialfinance.org/2009/08/blog-pleasant-valley/). The co-op is dedicated to selecting sustainably produced and wholesome foods that are organic when possible and preferably sourced locally. The local part means things that are not brought on the UNFI truck or shipped from Azure. I find myself wondering how to make choices. Sometimes a fine local product is available but in order to get the version with the organic label it has to be shipped halfway around the world. Many people have expressed the idea that the co-op should select products that are local or regional first and U.S. or North American next, and generally avoid items that come from afar, especially if the conditions of production might be questionable. I have in the past posted a sheet near the wrapping counter along with cut off labels when possible to make source information known regarding the bulk items that are packaged in the store–usually snack items and fruits and nuts. All of those items are certified organic, but at least half of them come from very far away beyond oceans, often from places where organic inspection is not reliable. Occasionally one of these bulk items turns out to be unpleasantly stale. As far as local items for the co-op are concerned, for the last two years I’ve made every effort to be personally acquainted with our apples in the stem and carrots in the root, our meat on the hoof and our honey in its buzz. I know my own eggs in their feather and my milk in the moo, but getting acquainted with those items brought by truck to the co-op is nearly impossible. Last week Anna and I made an excursion to Skagit Valley to see what we could find. We visited Golden Glen Creamery in Bow-Edison, a regular old family dairy farm that offers cream-top milk in glass bottles, their own butter and cheeses, and eggs from hens that scratch in the garden behind the office. Please look at their website and consider how the co-op should think about carrying these products: http://www.goldenglencreamery.com/ I’ll have to make a longer visit to ask more questions, actually meet those cows and chickens, and taste the products before I can give any solid information. In general I think I would prefer their unhomogenized small batch pasteurized milk in glass to O.V.’s much transported and comingled product in waxed cartons. I’d choose eggs from a flock I can count over the Wilcox eggs we now carry, which, while certified organic, come from a flock of 800,000 hens in large buildings in Roy, Washington. Others will have different ideas and I’d like to hear what they have to say. We also visited Pleasant Valley Farm and brought home pickles and kraut from right there where they were born in Laconner rather than from vegetables sourced in India. They are delicious but mass produced, without organic claims or certification. Some will disapprove; for others, local sometimes trumps organic, especially when the carbon footprint is considered. And we visited the IGFC store and plant in Bow where our island-grown meat that is slaughtered on farm by the mobile USDA truck is butchered and packaged for us–just so I could complete the picture. The more feedback I get the easier it is for me to decide what I should bring to the co-op and what I should pass up. Please add to this conversation and chat with me when we’re in the co-op so I can get a sense of what people want in the store.